Pope Francis shakes hands with Israeli President Reuven Rivlin during a private audience at the Vatican on 15 November. Photo: Paul Haring/CNS. “The hope was expressed that suitable agreements may be reached” also between Israeli authorities and local Catholic communities “in relation to some issues of common interest”, it said, adding that the Holy See and the State of Israel would soon celebrate the 25th anniversary of establishing diplomatic relations. Pope Francis presents a gift to a member of the delegation of Israeli President Reuven Rivlin during a private audience at the Vatican on 15 November. Photo: Paul Haring/CNS. 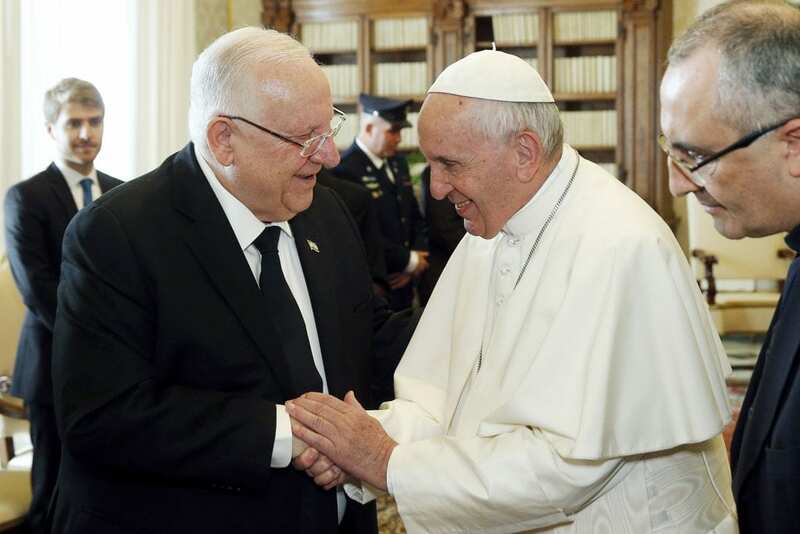 Aided by interpreters, Pope Francis and President Rivlin spoke about “the political and social situation in the region, marked by different conflicts and the consequent humanitarian crises. In this context, the parties highlighted the importance of dialogue between the various religious communities in order to guarantee peaceful coexistence and stability,” the statement said. Exchanging gifts, President Rivlin gave Pope Francis a small bas-relief replicating the walls of the Old City of Jerusalem. According to pool reporters, the president told the Holy Father that the image showed how one could divide the various parts of the city, but also unite it in new ways. The walled Old City is divided into the Jewish quarter, the Armenian quarter, the Christian quarter and the Muslim quarter. “Jerusalem has been a holy city for the three monotheistic religions for centuries. For the Jewish people, #Jerusalem has been the spiritual centre since the days of the First Temple over 3000 years ago, but it is also a microcosm of our ability to live together,” the President tweeted later, adding a photo of the two of them speaking during the gift exchange. Pope Francis walks with Israeli President Reuven Rivlin, accompanied by his wife, Nechama, during a private audience at the Vatican on 15 November. Photo: Paul Haring/CNS. Since then, the Israeli government set up a negotiating team to resolve the dispute.